"Next week, we hear, be problem." 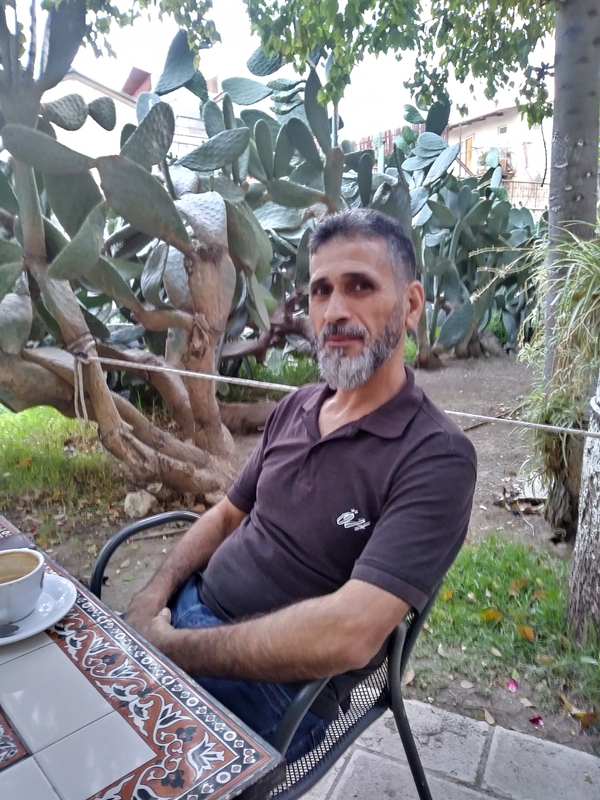 “You know, nothing has changed,” Marwan Ganam, 45, a Palestinian family man and reception desk clerk said from the beautifully manicured gardens at the Austrian Hospice colonial-era guest facility located in the heart of the Old City’s Muslim Quarter in occupied East Jerusalem. More than most people, Marwan has an up-close perspective on the ongoing Palestinian-Israeli conflict. 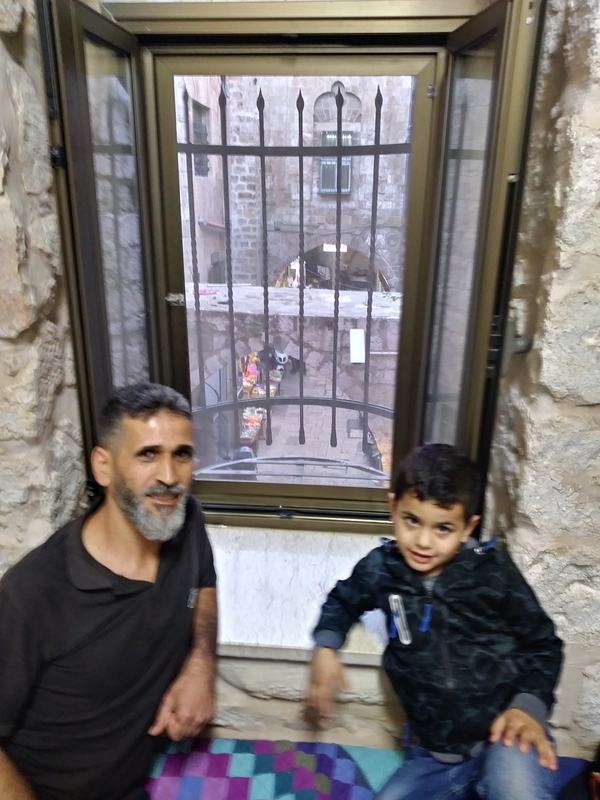 He has lived in the Muslim Quarter of occupied East Jerusalem’s Old City his entire life in a home in an archway directly above the main Al-Wad Street, a home he says has been in his family for 600 years. His wife and four children, three boys and one girl ranging from 4 to 19 years old, live there with his mother, while his brother’s family resides on an upper level. He has worked mostly overnight reception at the Austrian Hospice guest house for the past 8 years located just a few minutes from his home, both his job and residence on the important Al-Wad thoroughfare that leads directly from the Damascus Gate opening on the Old City stone walls straight down to the Wailing Wall plaza, as well as the plaza entry to the Al Aqsa Mosque, third holiest place in Islam. “It’s more hard now. Before it was easy. Before the 1st Intifada, I remember we have good life here. Also with the Jewish and the Palestinian, it was good. No problem. Yeah, we work together, we have many friends from the Israelalian. I have many friends. Yeah, it was quiet. It was good, too. We have tourists. Many Jewish they come here and they go to our shops eating hummus, they going around the Old City. It was quiet and everything. It was good, you know. A big part of the ongoing tension here involves provocative regular Zionist demonstrations protected by heavily armed Israeli authorities that parade through the Muslim Quarter. “Every month, (Zionists) they have demonstration. Maybe 3 or 4 hours,” Marwan said. 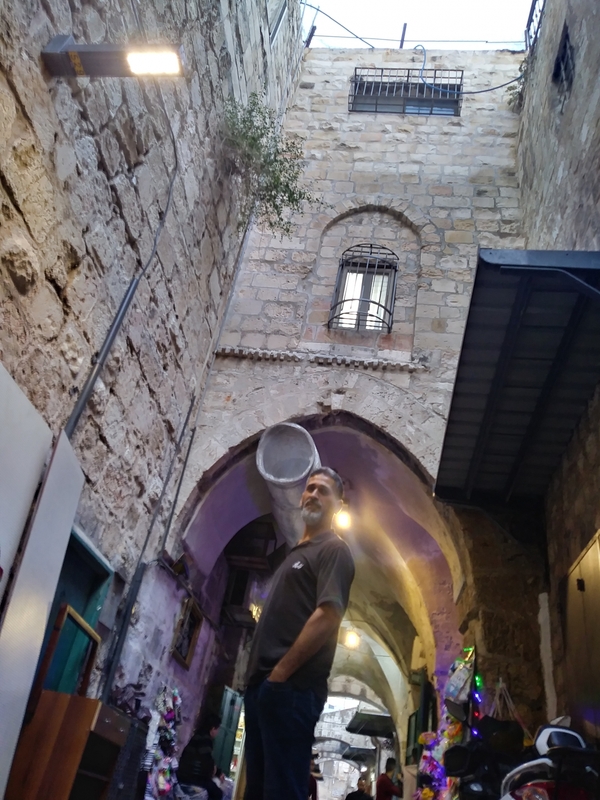 “They close the Old City from the Western Wall to the cross street here at the Hospice. They march from the Western Wall, around the gate of the Al Aqsa Mosque until the Lion’s Gate, (a main southern entry to the Old City). This way, you can’t walk. If you are Arab, you can’t walk in this street. They close all the shops and put police barricades and you can’t walk. On top of this ongoing tension, the highly controversial US embassy relocation to Jerusalem is set for May 14 when Israel marks its 70th anniversary, followed on the 15th when Palestinians commemorate the Nakba Day “Catastrophe” recalling their mass expulsions and village destructions by Zionist armed forces in 1948. The Islamic Month of Ramadan also begins in the region on or about May 15 bringing 100’s of thousands of Muslim pilgrims into occupied East Jerusalem to the landmark Al Aqsa Mosque. Published reports also note that starting this Saturday will be the always dramatic annual Jerusalem Day events when Israelis, mostly Zionist settlers, march provocatively through the Muslim Quarter in Jerusalem’s Old City to mark the ’67 Israeli military capture of Palestinian East Jerusalem. Like the monthly Zionist provocations on steroids. Like the annual Protestant Orange Order marches through Catholic Belfast and Derry. And, of course, the world has been witness to the recent #GreatReturnMarch demonstrations by Palestinians in Gaza where Israeli military snipers from their side of the border have shot dead at least 40 people, including two clearly marked press members, and wounding more than 5,000 others by live fire, tear gas attacks and other means. Those #GreatReturnMarches are only expected to intensify with this upcoming Nakba Day. So does he expect any help coming from anyone in the international community? As a young man, Marwan was an active part of the Palestinian resistance against the decades-long Israeli occupation. As a 16-year-old student barred from classes when Israelis shut down his school, Marwan joined the 1st Intifada conflict. “The first Intifada, you know, it start because one of the settlers they kill 7 Palestinian people. After everyone, they hear about that, and it was demonstration everywhere, and they start to throw stones at the soldiers. In Jerusalem, Ramallah, the West Bank, everywhere. “Here, we have many settlers in the Old City because they have the Western Wall. 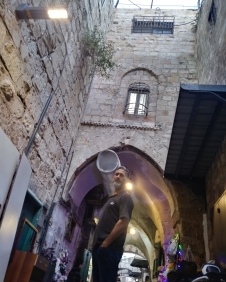 This street Al-Wad is very important street, from Damascus Gate until the Wailing Wall, it’s straight. In the 1st Intifada, everyone was in the 1st Intifada. Because it was just stones, no guns, no knife, nothing in the 1st Intifada. And everyone, he was there. How exactly did they take you into custody? Marwan was allowed to change out of his bed clothes while a policeman was present. “They took me and put (restraints) on my hands, and my legs, and (bandana) over my eyes. I could only walk slowly, slowly. Many separate incidents contributed to the start of the 1st Intifada in December 1987, all these boiling over from the Palestinian population chafing under strong Israeli military occupation of their territories for years since the Israeli victory in the 1967 Six Days’ War. As always, the Palestinians were placed at a horrible imbalance of power. “The Israeli response to the Palestinian uprising was harsh,” claimed the wiki page. “The IDF killed many Palestinians at the beginning of the Intifada, the majority killed during demonstrations and riots. Since initially a high proportion of those killed were civilians and youths, Yitzhak Rabin adopted a fallback policy of ‘might, power and beatings’. Israel used mass arrests of Palestinians, engaged in collective punishments like closing down West Bank universities for most years of the uprising, and West Bank schools for a total of 12 months. Round-the-clock curfews were imposed over 1,600 times in just the first year. Communities were cut off from supplies of water, electricity and fuel. At any one time, 25,000 Palestinians would be confined to their homes.” The 1st Intifada lasted from 1987 to 1993. “They took me to the police station on Jaffa Street, Moscowvia. It’s for the Russian people. They put me in a small Ford, the driver, a guard, and two of us. They took me to secret police to ask me ‘What you doing? Why you throw stones?’ Things like that, you know. In the beginning he ask me, and I don’t answer. So he start to punch me. He put me on the chair. My hands behind my back. And he was sitting close to me, and he asked ‘What you doing?’ I say ‘nothing.’ He hit me in my face. He hit me so strong there. ‘What you doing?’ I say ‘Nothing.’ He hit me again. If I don’t answer, he start to hit me. He asks me like two or three hours. And every time he hit me. I don’t answer, he hit me. “After I don’t answer, he took me and put me like in stone cupboard. Stone cupboard, like a closet, but small one. He put me inside, and he close. Yeah, small one. Just maybe 15cm by 15 cm. He put me inside, and said, ‘You don’t want to answer, now you will answer.’ After maybe 30 minutes, 35 minutes, he get me out again. Because inside you can’t stay long time because the air, you can’t (breath). He bring me out, and he say ‘What you doing?’ I say, ‘Nothing. I just throw stones,’ after he punch me again. “He want to know everyone he was with me, ‘What we doing?”, yeah, everyone. I told him I was alone. He said to me, ‘You are a liar.’ He start to punch me again with sticks. In the body, hard. He said to me ‘You are a liar.’ I say, ‘I am not lie. I was alone.’ After maybe four hour total, he called the police and let him into the room. He was secret police. “The regular police took me to the room with another guy. Maybe 14 guys in the room. I maybe know maybe 3,4 from my street. When I enter, they saw me and say ‘Hey, Marwan! What’s happen?! What’s happen? !’ I told them ‘Nothing.’ And they look to me, here was blue and green where he punch me (pointing to both sides of his front neck). This side and this side was, ah, green and blue. “I sit there maybe two hour, three hour. And the police come again, “Hello Marwan!” They took me again. The secret police they want to ask me again. The same guy, yeah. He come over there. He say to me ‘Who was with you?’ I tell him ‘Nobody!’ He say ‘liar.’ He say I was with another friend. I say ‘No I wasn’t! I was alone.’ And he didn’t want to say I was alone. He didn’t believe me. And he asked me two hours until morning. Maybe 10 in morning. “After, I hear they bring another guy; he was with me. His name Iman. And I hear him in the second room. He say ‘Yeah, it was me and Marwan and another guy.” Because they police, he need me to hear him. Yeah. I know he say about me and about him. I feel bad, you know, because they hit me strong and I say “No! No! I don’t know anyone!’ But I say no problem. “When I heard my friend say it, I admit it was me and him. The secret police said ‘Why you no say before?’ I say ‘I am afraid, and I don’t know.’ He say ‘Ok’ and after he ask me two or three times and they put me in the big room again. The next day, they took me to the judge. Me and another friend to the same judge. The judgement he give me 18 days more. He asked me what happened? I told him they punch me. And it was lawyer for the government. He was an Arab lawyer. He talk with the judge, he say “They are kids. They are small.’ He try to help me, but he can’t. The judgement they gave me was 18 days more. Marwan served that time back at nearby police station, and they brought him before the judge again after the 18 days. Now he received a six months jail term. The time was spent with other 16- and 17-year-old stone throwers at a prison near Jenin hours from home. Actually, it was not a horrible experience, at least for his pre 18-year-old Intifada comrades. “Maybe it was fun at the beginning for us. The first time you enter the jail.” They received two hours daily outside cell time in the fresh air. 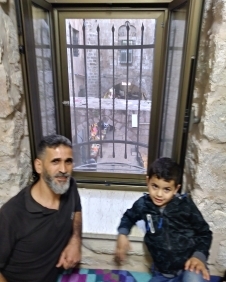 And an older jailmate who had been there for two years taught the other young prisoners about the Intifada and political situations, as well as regular reading and writing skills if needed. “Yeah, it was good. 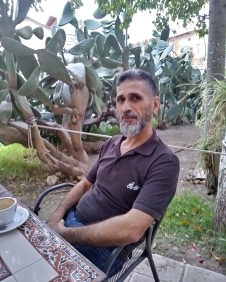 I meet people from my street, and it was fun.” Marwan said he was proud of his anti-occupation resistance. Marwan said they did not torch any settler cars with people inside, and he didn’t kill anyone. Unlike the first time when soldier snatched him from home in the dead of night, Marwan’s capture experience was much different. “They shoot me. Here, you see?” and points to his inner right arm in the fold opposite the elbow. “It was in the street. We are fighting with the soldiers. He was close to me like maybe 1-and-half metre, and he shoot me here (in the arm) and here (a grazing shot to the right side near the kidney), you know? But this one (on the arm) was very hard because it enter in my arm. Soon, Marwan was back in jail for a much longer stretch. “When they took me to the court, the judgement, he gave me 33 months. There was many people from all over, from Jenin, from Ramallah, from Gaza, from everywhere. I was more than 18 years old, not small. Again, Marwan found positive aspects to the incarceration. “They taught us very good. Every day we sitting in the room, and we talking about history, about many thing. Like a school, yeah. Every day in the morning they give you book, you need to read one hour and after you make conversation, and everything. They ask you what you learn. It was a teacher from Gaza. He was many years in the jail, and he know everything. He was a good teacher. He teach everyone. Mohammad. “I had no family. It was easy for me, you know. In my time, it was easy. But now, today, the jail is very hard. Yeah, the first time was easy. The second time was not so hard. Not like this (current situation). But this time now is very hard. If you enter to the jail it’s very hard. Not like the past. Now the police they hitting. I heard it’s terrible more. After his anti-occupation fighting and jail-time experiences, Marwan said he had had enough. “When I come out (after about 5 years total in prison), I was 23 and I was finished. My time is finished. And I work, and I want to make family. My mother said to me ‘We engage you and it’s finished for you.’ Because I was in jail and my father he die outside, and I was in the jail. They don’t give me to go out. He was old and I know he will die, but I didn’t know when it happen. Former fighters are usually some of the best people at making peace. They understand the direct and up-close consequences of the decisions of others who often have no direct conflict experience.